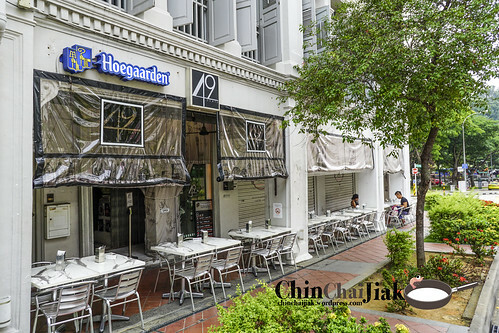 49 seats is situated along the stretch of shop house, at the end of Kreta Ayer street. Comparing to most cafes and restaurants, the unique thing about this branch is they only open at 6pm and closes late at 2 am, even on a weekday. Thank you BB and Fang Fang of 49 seats for hosting me. This is an invited food tasting session and i decided to accept the invitation after reading so much about their Smoked Duck Aglio Olio and their Tom Yum Pasta. 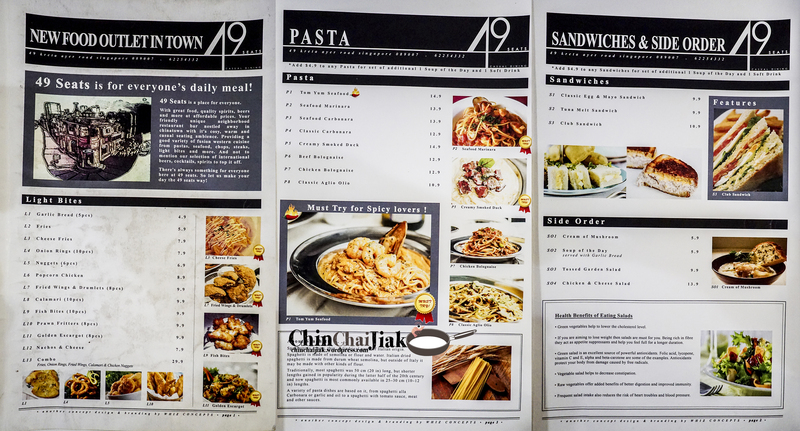 This is their so-call off menu dish (although there is a pic of this pasta at the ordering counter). Apart from their Tom Yum pasta, this is another of their signatures and this is my favourite dish among all. 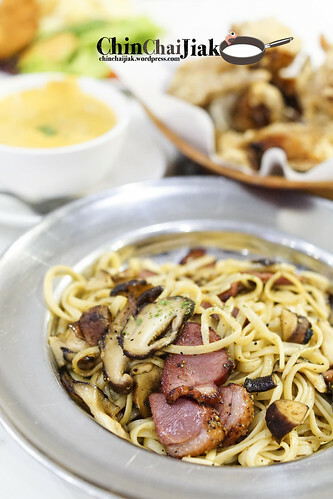 Apart from the generous serving of buttery mushrooms and tender slices of smoked duck, the pasta itself is pretty good too. There is a pleasant fragrance coming from the pasta which it guess there’s something to do with the oil of the duck. The slices of duck meat is not tough at all and the well marinated duck skin may just be the contributing factor for the popularity of this dish. 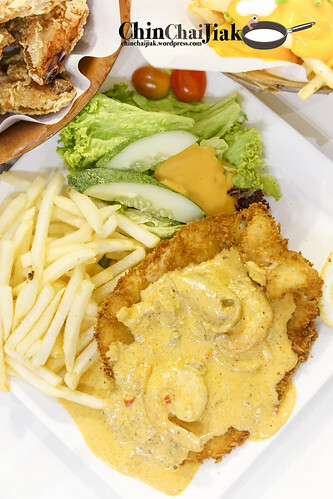 49 seats is rather proud of this creation – The Tom Yum Fish and Chips, and claimed that it’s currently the only one kind in Singapore. 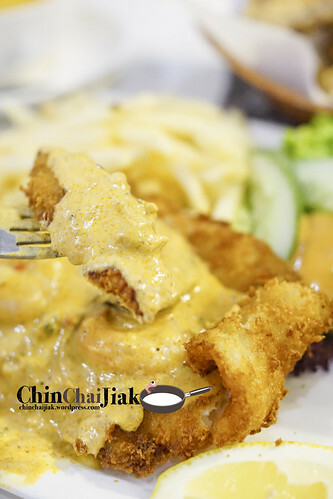 The tender breaded fish fillet is fried to crisp and served with fries. They also provide a separate bowl of Tom Yum sauce as dip or to be drenched over the fish. Dipping it may be a better option so as to retain the crisp of the fish. I think that the fish is quite average so the deciding factor will be on how well does the tom yum sauce complement the fish. Sad to say that the tom yum is overly salty and that’s the only thing i taste. I also think that to complement the strong Tom Yum sauce better, it may be a better idea to go with a lightly battered fish and chips instead of a fully flavoured breaded one. This is like 49 seats’ signature of the signatures and has a reputation of one of the most spicy pastas around. 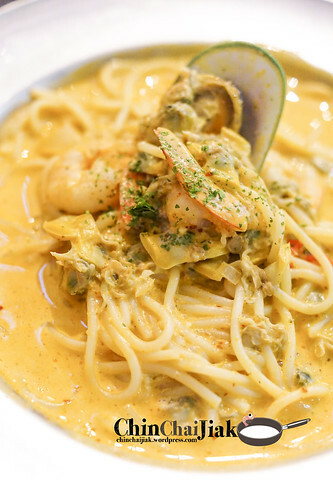 The pasta sauce is a blend of cream sauce and tom yum spices. I thought this sauce is more creamy than expected and has a moderate punch of Tom Yum fragrance and is less sour and spicy than expected. I would very much prefer a much stronger tom yum flavour while maintaining a lighter cream base. 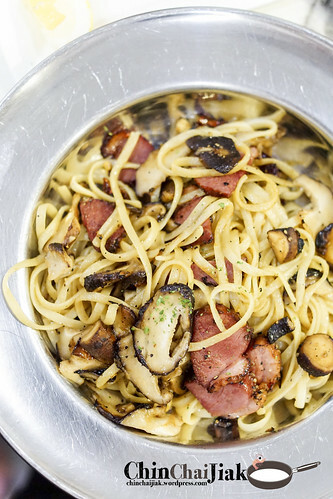 The pasta is boiled till moderately soft, which generally suits the taste of Singaporeans. 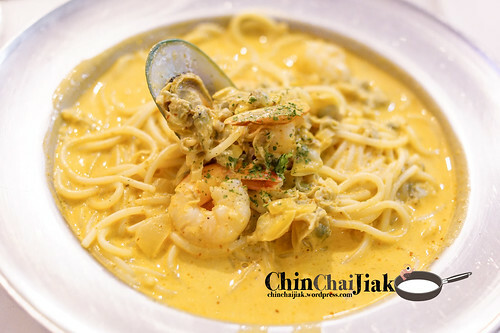 Comparing to a bowl of hot spicy tom yum soup, this pasta lacks a bit of the “shiok” factor. However if i am to judge this as an entirely new creation, it’s actually pretty addictive after having the first mouthful. I have no complain for this cheese fries. At $7.90, it comes with a good portion of fries, top with a hell lots of cheese. This got to be one of the most generous portion of cheese that i’d ever seen. 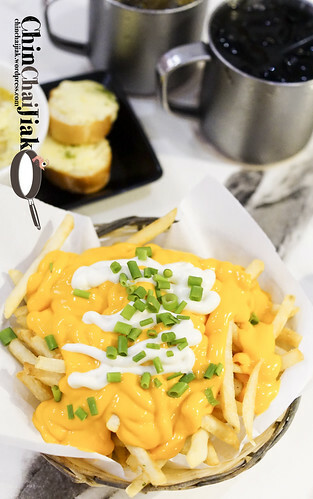 The cheese taste like a cross between KFC’s Cheese Fries with Golden Village’s Nacho Cheese in term of taste and texture, which is not as sweet like KFC with a not-so-creamy texture. This is an ideal dish to order to go with a nice cold bottle of beer. 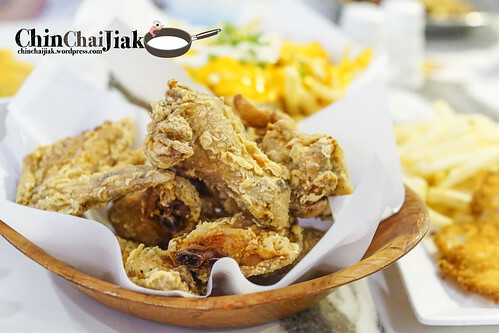 Their chicken wings are fried with a layer of seemingly simple blend of breading. It’s doesn’t has the most exciting flavours but I am satisfied with the traditional taste. The wings are rather well tenderise as the meat get seperated from the bone quite easily. The plus point? Juicy. The minus? Can be more crispy. I thought a good dessert will complete the whole dining experience and it’s a pity that this waffle fall short of expectation. 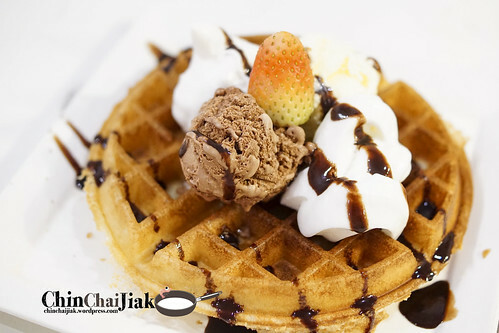 49 seats waffle is actually sweetened, like a typical Prima Deli kind of waffle, but it lack in flavor and fragrance. The ice-cream taste like a typical Wall’s ice-cream tube and for the price of $10.90, there are definitely better alternatives out there. Not recommended. I think this place and their menu selection will very much appeal to fun seeking youngsters. It has a very cosy and casual dining environment and they are also offering their food at a reasonable price. 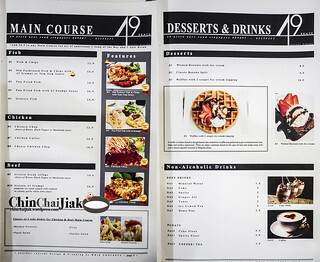 All prices indicated on the menu is nett, with no additional service charge and tax. Recommended dishes – Smoked Duck Pasta, Cheese Fries, Chicken Wing. 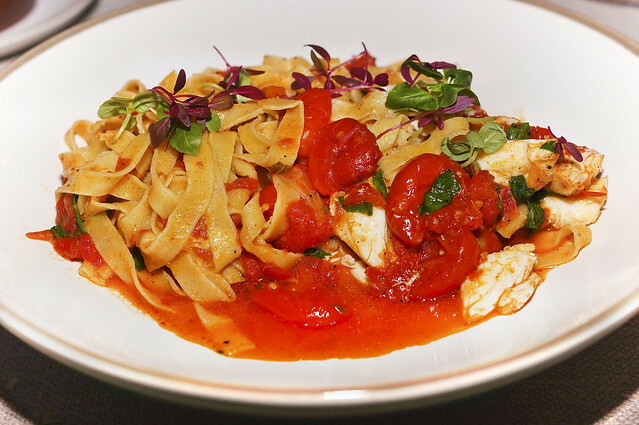 Tom Yum pasta may also be something interesting to try. 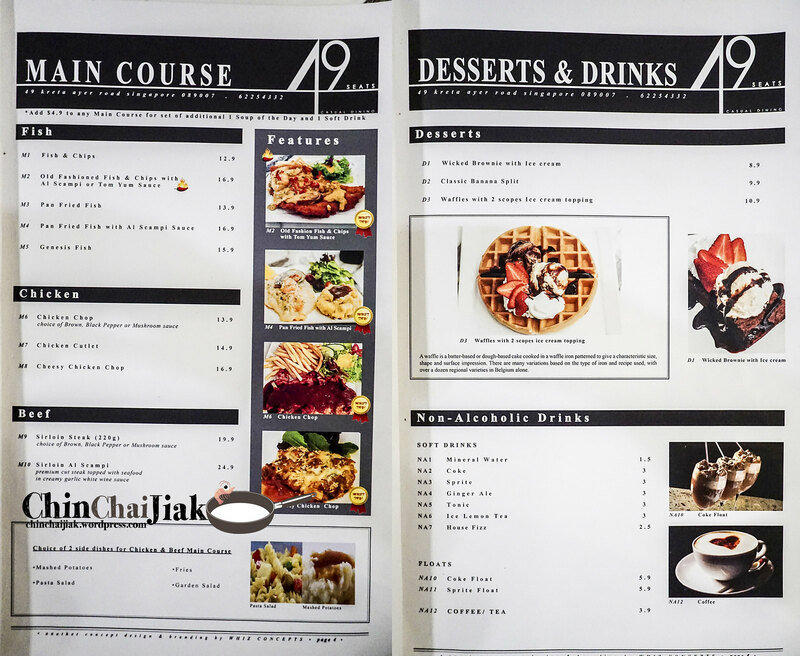 In fact I went back to 49 seats (and that is when i also tried their Tom Yum pasta) as this place came to my mind when looking for a casual drinking place that opens till late. The cheese fries and fried chicken wings will probably be on my regular order when i visit this place. 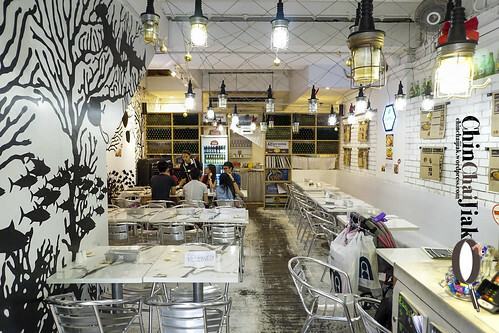 Although the dishes here are not something to die for, it’s pretty decent and it can be an option if you are looking for something not heavy on wallet and yet looking for a more-comfortable-than-hawker kind of dining environment. 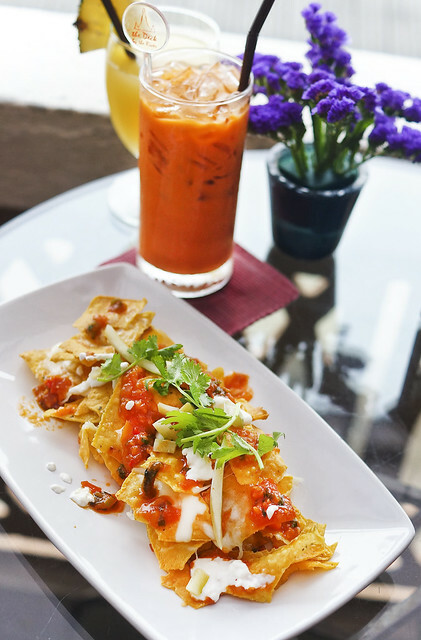 Quince Bangkok Eatery & Bar is situated at the Sukhumvit area that is a few minutes walk away from Phrom Phong BTS. 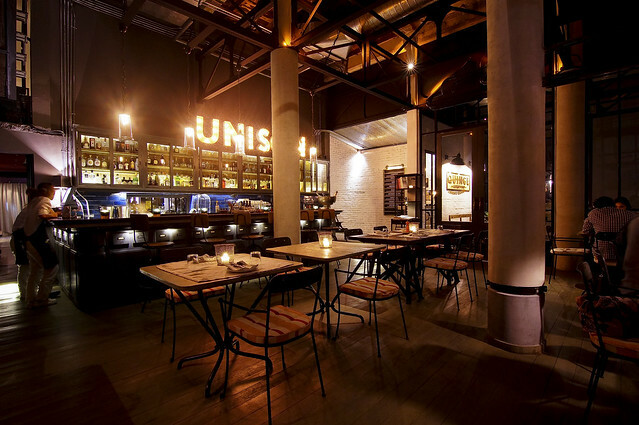 Apart from street food, authentic Thai food and cafes, Bangkok also has some very romantic, posh and classy restaurants and Quince Bangkok Eatery & Bar is one of them. 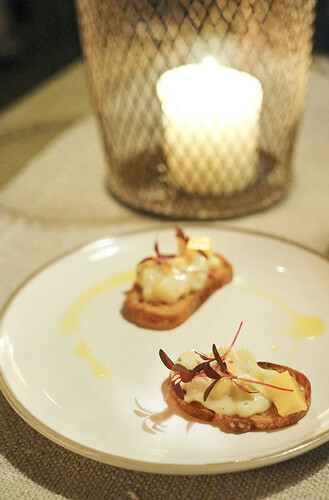 This romantic fine-dining restaurant is relatively new which was opened in year 2012 and this place generally has some mixed reviews. I fell in love with this place almost immediately. 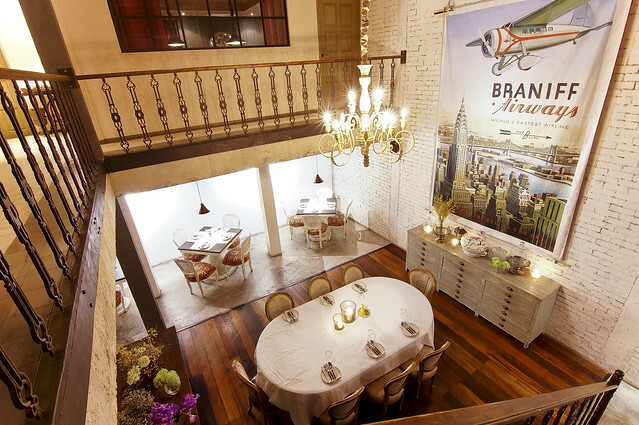 No crowd (on a Sunday night), good food, relaxing setting, great interior and great (but slightly slow) service. Reservation can be made through email and they can even send a copy of their seasonal menu to you before deciding to make a reservation. The pricing wise is a little to a higher side for Bangkok standard, for example a Grass-fed Striploin cost S$31.60++ and a crab meat pasta cost S$15.20++. But in fact the price is still cheaper than Singapore’s restaurant price. The eatery is separated into the bar area as shown in my first photo, and the dining area is behind a wall and it’s a different world. 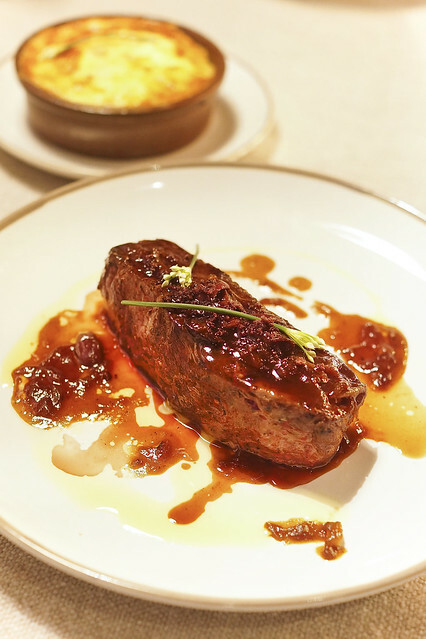 I ordered this steak that comes with a their baked Macaroni Gratin and I think it’s very worth it at 790 baht. 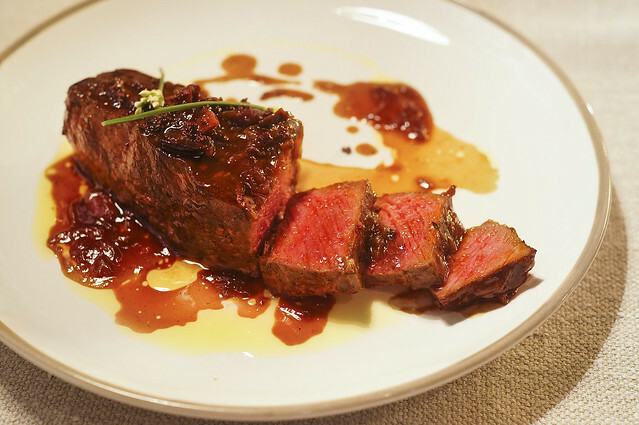 Some of us may wonder – what does Grass-fed Beef means? Apparently, the grass-fed cows lived out their entire life roaming freely on grassland instead of being cooped up in feed lot. The grain-fed cows are rapidly fattened up with grain-based feeds, usually made with a base of soy or corn. while the grass-fed cows gain weight naturally and logically taking more time to reach the weight of a typical grain-fed cow. Grass-fed cows also get more nutritious food from the nature and not just munching on monoculture lawn cuttings and studies show that grass-fed beef contains more nutrients and less toxins. Therefore, Grass-fed beef are naturally more costly than a regular grain-fed beef. 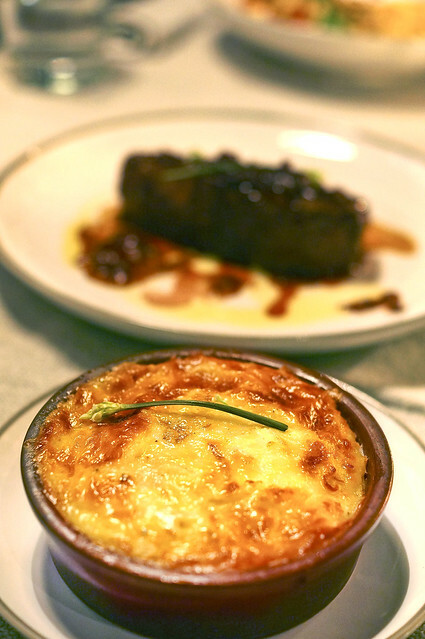 On the other hand, the macaroni gratin that comes with the steak actually fall short of my expectation. Apart from the top layer of cheese, the taste of the macaroni is rather plain, and lack of flavor. Such a waste. I also ordered their side dish – Crispy Quail Eggs at 120 baht. This dish is interesting and the taste is rather refreshing. This is my first time trying the potato foam, which has a sweet cream and lightly salted taste. 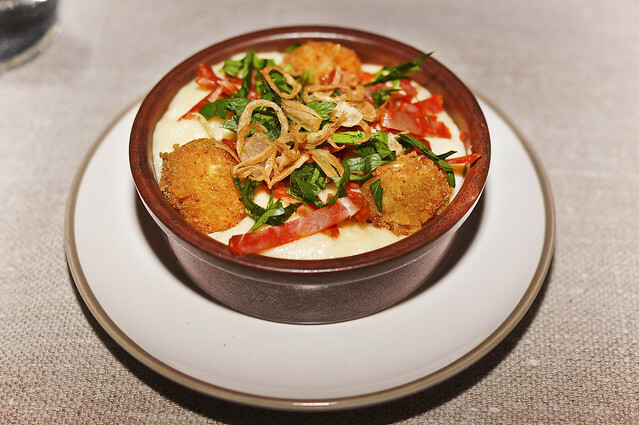 Three crispy breaded quail eggs are added into the foam and topped with thinly-sliced Chorizo. Something that i never tried before and glad that i did. 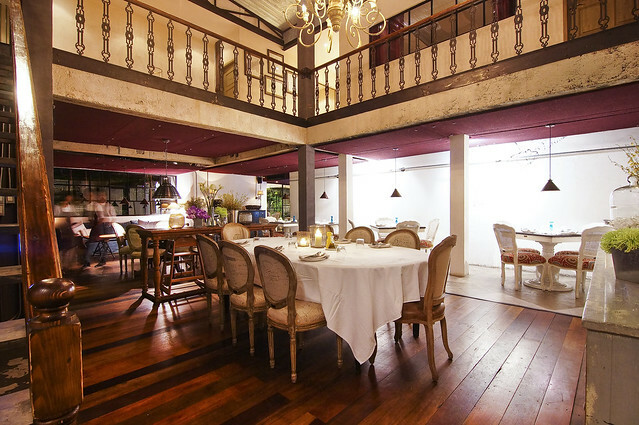 Quince Bangkok Eatery & Bar is a place that offers you a fine-dining meal at a normal restaurant price. Typically, at Singapore, such a meal with a similar ambiance can easily cost me for more than S$100.00. As for their service, the waiters are attentive and very responsive. When i walked around taking photos, on a camera tripod, nobody bats an eye and allowed me to roam freely around the restaurant without any weird look. I really appreciate this. The only problem is, the food were served a bit slow, which i figured out that they needed some time to bake the potato gratin that comes with my steak. 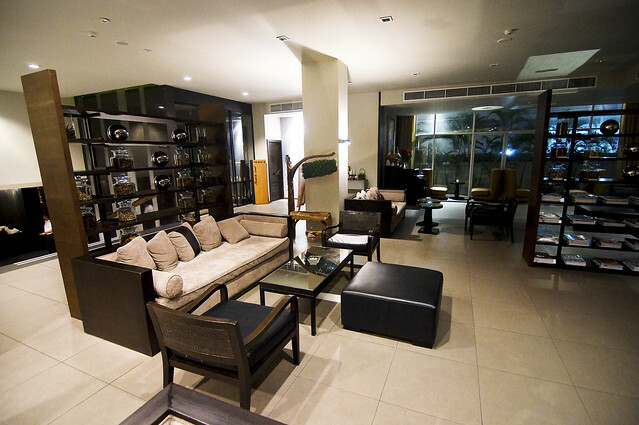 The location is also rather accessible, with a few minutes walk from Phrom Phong BTS. Overall, i am a very satisfied customer. Some of you may had noticed that i didn’t order dessert? Yeap, that is because after this meal, i am transiting into a street food mode and will attack the so-call “Bangkok Best Mango Sticky Rice” at Sukhumvit Soi 38. Feel free to read more on this food street from this post. For those who are looking for a place to celebrate any special occasion, apart from the sky bars in Bangkok, this may be a rather ideal place. If you still have time, then i will probably recommend a massage place – Healthland Asoke, that is only one stop from Phrom Phong BTS. 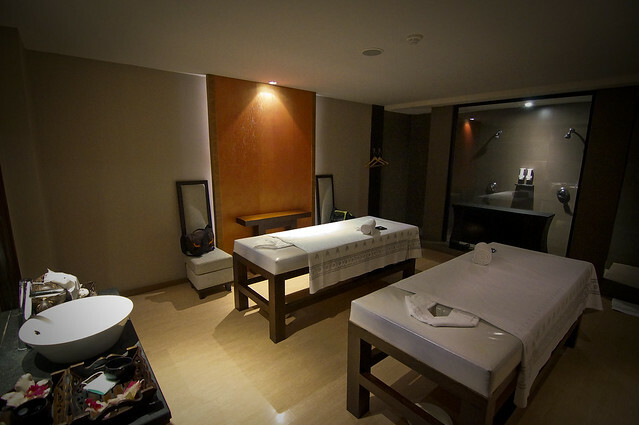 Why not indulge yourself and complete the night with a relaxing couple massage. Their price is very reasonable for it’s class. 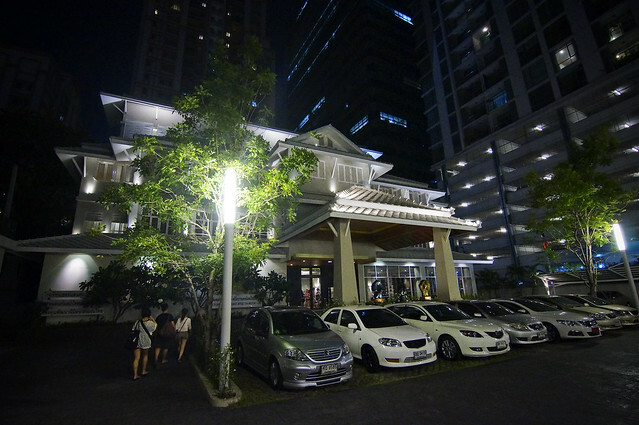 This is their website: http://www.healthlandspa.com/asoke.html and remember to call for reservation. And no, i don’t earn any commission. LOL. As a lover for landscape photography, I will always try to make some time to visit attractions for some shots while I’m overseas. 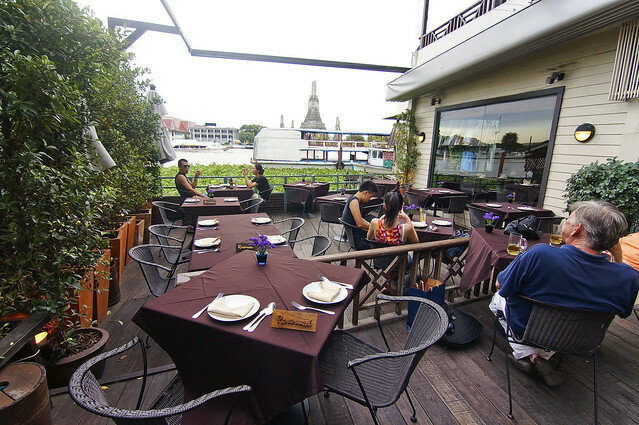 The Deck is situated just directly opposite Wat Arun (Temple of Dawn) across the river, which is within walking distance from The Grand Palace and Wat Pho (Temple of the Reclining Buddha) or Wat Phra Chetuphon. 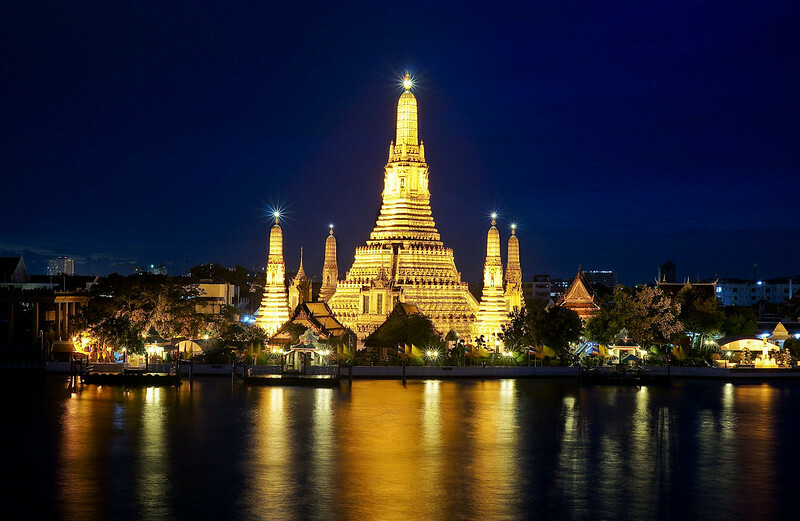 It is the perfect place to take a good shot of Bangkok’s Wat Arun. 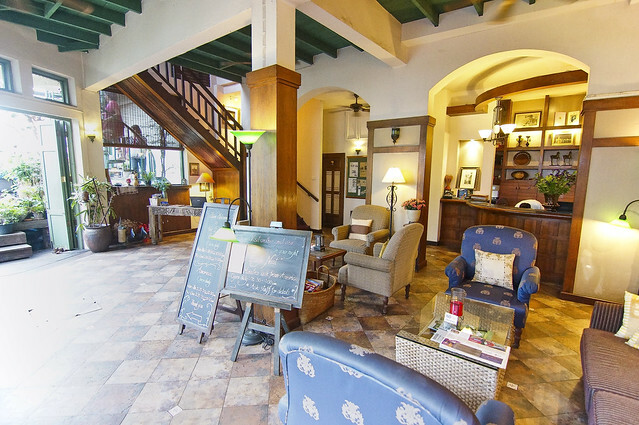 While I am expecting a classy and posh restaurant that is within a up-class hotel, i am pleasantly surprised that The Deck is not such a place and i thought this cosy and homely residence/restaurant may just be it’s charm. The deck is divided into three levels, while level one and two are reserved for seated dining, level three is their bar area. There is a spiral staircase that leads up to level two, and need to climb up a flight of metal steps to reach level three. The dining area at level one is at the sun deck of the house with only a couple of tables that are well-spaced from each other. Seems pretty romantic at night? 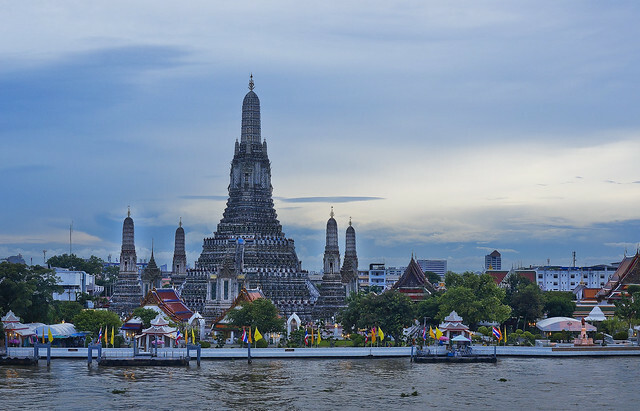 However, from the photo, you can see that a boat almost blocked the whole view of Wat Arun. The dining area in level two is able to accommodate large dining crowd. I thought the level three area offers a much better view and since my main objective is to shoot instead of eat, i opted for the level three bar. 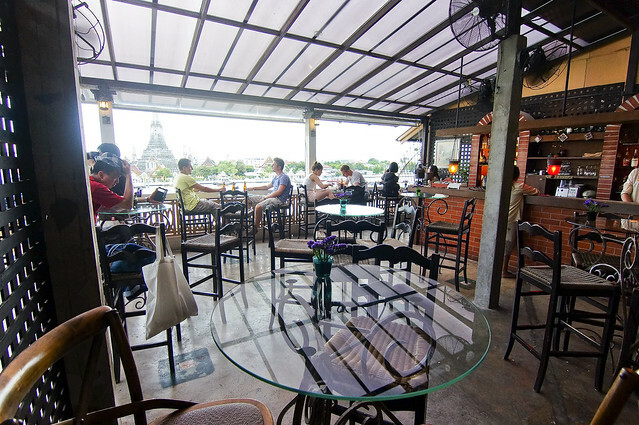 Within the bar, there are only five or six tables that offers a direct view of Wat Arun and i am glad that I made my way there early at 5.45pm and i manage to secure the last unoccupied table that offers a great view of Wat Arun. The bar offers finger food and drinks. 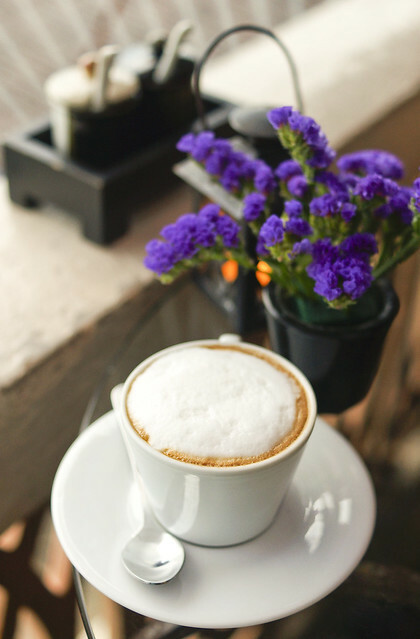 Those who don’t feel like having alcohol may order their coffee/tea or juice instead. Yeap, a bar that offers coffee and tea. 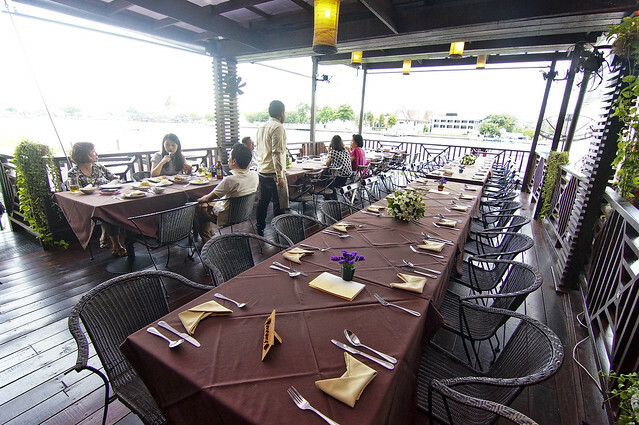 As I plan to visit the “Bangkok best phad thai” for dinner, i am giving the main course at The Deck a miss. I ordered the safest food – cheese nachos and sausage. The taste of the nachos actually exceeded my expectation. I was munching on the nachos and i cleared the plate in no time. Love the thin chips coated with warm melted cheese. And how wrong can sausages go? 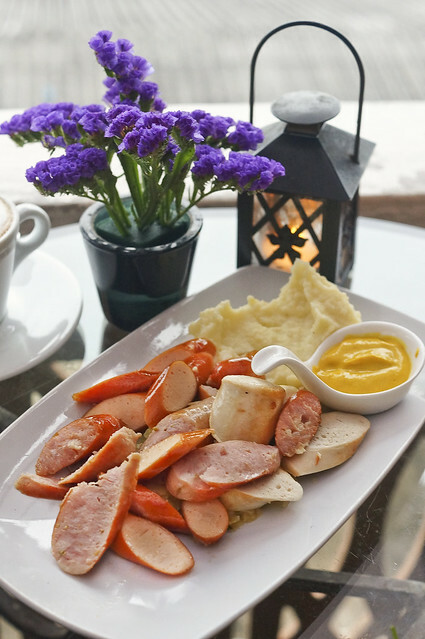 There are three different kinds of sausage in the platter that tasted like – Chicken cheese, chicken, pork and comes with a side of mashed potato and a portion of mustard. Great for sharing. By the way, I don’t exactly enjoy their cappuccino as much as I thought I tasted some spices in it and it taste rather weird. Bangkok’s sun sets at about 6.15pm to 6.30pm and it was a pity that the sun set was blocked by some thick cloud thus unable to catch the yellow egg yolk. Such a waste! But nevertheless I thought I still managed to capture a rather decent night shot of Wat Arun, i think. LOL. What do you think? I am someone who can enjoy doing nothing and just find a cosy corner and chill out with friends while enjoying a view and enjoying the river breeze. 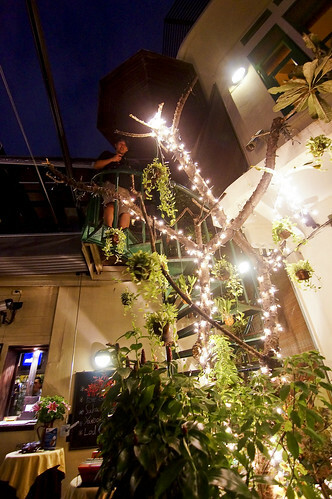 This place sets a world apart from the up-class rooftop sky bar where visitors need to be in their long pants and flip-flops are a strict no-no, The Deck offers a very homely and casual kind of setting for friends to gather or romantic-seeking lovers to visit to have a good drink and chat. The only problem with this place is for it’s location as Singaporeans (or any other visitors) very muck like to stay around Pratunam/Asoke/Siam area for it’s shopping convenience. I had to take a cab ride that took me around 20 minutes to reach The Deck @ Arun Residence. 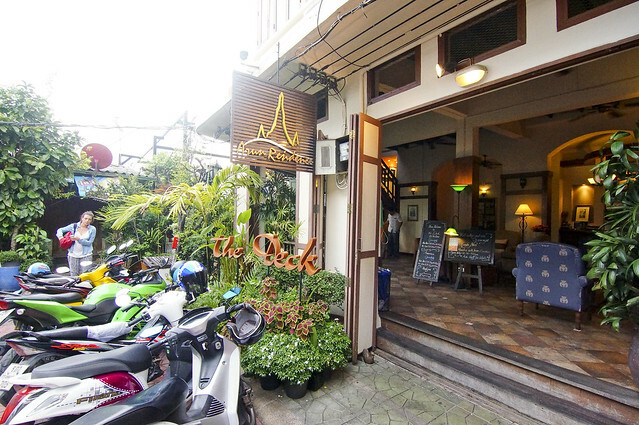 If you are already visiting the Grand Palace, Wat Pho or Wat Arun, why not have a rest at The Deck for a drink before heading back to Hotel. The sky is already dark and i set off to the nearby “Bangkok Best Phad Thai” for dinner, which will be covered in my upcoming post! As The Deck is not near to any particular MRT or BTS station, i took a cab directly to this place. Note that this place is not along the main road and the cab driver got to turn into a smaller lane to be able to see this place.